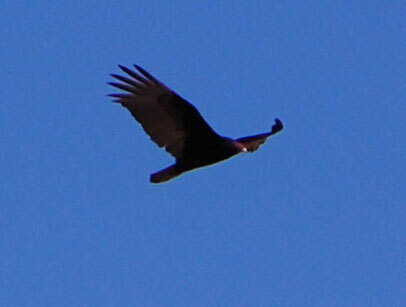 Turkey Vulture patrolling the western foothills of the Estrella Mountains, Maricopa Co., Arizona, USA. 01 April 2009. These large soaring birds have a characteristic dihedral wing pattern easily noticed from afar. From below in good light the plumage appears two-toned, black and gray-brown. The head is without feathers and conspicuously red in adults. Unlike most birds, turkey vultures have an excellent sense of smell and can detect carrion from a considerable distance, or even below a shady canopy of trees as they soar above a sycamore-lined canyon.